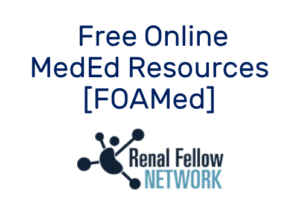 Cardiorenal syndrome (CRS) is a complex clinical entity that encompasses multiple interactions between the heart and kidney. Ronco and colleagues classified CRS into five types. Below, we’ll focus on CRS type 1, or acute cardiac dysfunction (such as acute decompensated heart failure) causing acute kidney injury (AKI). This typically includes patients with established chronic kidney disease (CKD) and/or heart failure (HF). CRS type 1 is particularly interesting as it represents a “pre-renal” cause of AKI, where the treatment is focused on decompression of congestion, particularly renal venous congestion. One would think that a decrease in the cardiac output would be the main culprit in this pre-renal state. Actually, the increase in urea/BUN in HF is due to vasoconstriction of the renal circulation that ultimately occurs due to the neurohormonal adaptations, induced by cardiac dysfunction. This increase of the urea/BUN is a surrogate marker of the neurohormonal activation in CRS type 1 and not a marker of reduced cardiac output. Other major contributors to AKI in CRS type 1, and probably clinically more relevant, are increased renal venous pressure and right ventricular (RV) dysfunction. The elevation of intra-abdominal pressure/central venous pressure (CVP) secondary to cardiac dysfunction, which increases renal venous pressure, directly reduces renal blood flow and GFR. This venous hypertension may contribute to intra-renal hemodynamic changes such as raising interstitial pressure and narrowing arterial-to-venous pressure gradient, and exacerbate the neurohormonal pathways linked to HF. Furthermore, there is also a direct effect of higher renal venous pressure on the renal parenchyma. This higher pressure directly opposes filtration in the Bowman capsule, causes collapsing of tubules, and may be the first initiating trigger for tubulointerstitial fibrosis. RV dysfunction can adversely affect kidney function due to its contribution to increased CVP and by impairing left ventricular (LV) filling, via a ventricular interdependent effect. Increased pressure within a distended RV increases LV extramural pressure, inducing leftward interventricular septal bowing, thereby reducing LV preload and possibly forward flow. This interaction usually occurs in the more severe cases of CRS type 1. How can POCUS help you diagnose and manage CRS type 1? The main problem in CRS type 1 is congestion, and POCUS is a great tool to augment your ability to assess it, since the sensitivity and specificity of the clinical signs and symptoms are often not satisfactory. For that, we have several tools at our disposal, such as lung ultrasound, vascular ultrasound, focused echocardiography, and more advanced hemodynamic assessments, like portal vein pulsatility or renal venous impedance index. Today we will focus on the basics. Lung Ultrasound is able to detect extravascular lung water (EVLW) through the finding of B-lines. The B-line is a hyperechogenic comet-tail artifact that arrives from the pleural line and moves with lung sliding. The detection of diffuse bilateral B-lines in a acutely dyspneic patient has a high sensitivity and specificity for detecting pulmonary edema and correlates positively with EVLW measured by thermodilution methods. Also, lung ultrasound has a higher sensitivity and specificity in detecting pleural effusion than chest x-ray and can even be used to estimate its volume. Vascular Ultrasound can be used for evaluation of the internal jugular vein (IJV), since its direct visualization through inspection is often difficult. This enables a quick and non-invasive estimation of the CVP, by putting a linear probe longitudinal do the right IJV and identifying the taper point. After this, the CVP can be estimated by measuring the height as for physical examination. Focused Echocardiography allows the detection of pericardial effusions, an appreciation of the chamber sizes, a gross visual estimation of the systolic function of both ventricles, and the evaluation of the inferior vena cava (IVC). Although the IVC measurements are far from perfect, they can discriminate between normal/low CVP and high CVP. Usually, an IVC with a diameter of more than 21 mm (measured in the subcostal view, approximately 2 cm of the right atrium) that collapses less than 50% with inspiration, represents a high CVP. Lung Ultrasound – multiple and bilateral B-lines. Focused Echocardiography – moderate right ventricle dilatation with apical hypokinesia and a leftward shift in the interventricular septum in diastole, and moderate-to-severe systolic dysfunction of the left ventricle. There are no signs of pericardial effusion. Inferior vena cava has a diameter of 22 mm, with no respiratory variability. In this case, POCUS confirmed severe pulmonary congestion and showed evidence of right ventricular dysfunction and increased central venous pressure, which made the diagnosis of CRS type 1 highly likely. There is a lot of potential for the widespread adoption of POCUS in the diagnosis and management of CRS type 1. Not only does it augment the clinician’s confidence in his diagnosis, but also increases patient safety and may improve patients outcomes by providing a more sensitive way of assessing congestion. 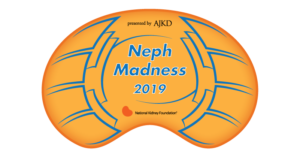 If you are interested in learning more about POCUS in nephrology, I highly recommend that you follow NephroPOCUS on twitter (@NephroP) by fellow #NSMC intern Dr. Abhilash Koratala. A warm acknowledgment to everyone at @NSMCInternship for creating and maintaining this incredible project.